I Took the PMI-PBA Exam! 8/20/2014 Update: Watermark Learning’s PMI-PBA Online Study Exam is now available! Also register for the PMI-PBA Certification Boot Camp today! I wish I could report how I did, but that information will not be available until after the pilot is completed in August. I feel it went pretty well. I hope so. (Update: I passed!) Having earned two previous certifications and having taught certification preparation training courses for a couple of years now, I should have some advantage in the test preparation and successful test completion. If you never hear from me on the subject again, then be very suspicious. Note: Task names listed on the chart are derived from PMI® domain descriptions. PMI® has not yet published official task titles. This table will be updated when this becomes final and available. 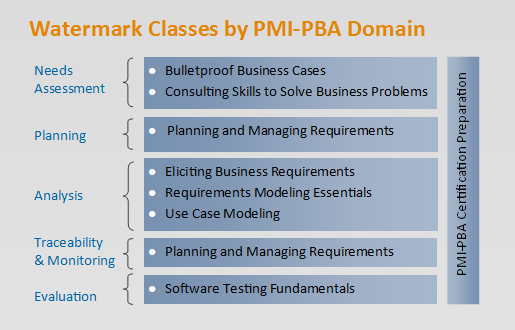 See the PMI-PBA® Content Outline for full descriptions. 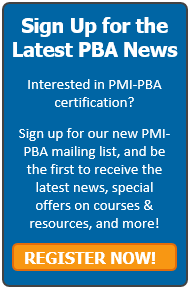 Another reference I used to prepare was the Knowledge and Skills section of the PMI-PBA® Content Outline. Specifically, I looked through the tools and techniques listed to create a master list of tools and techniques I may need to know for the test. The vast majority of these were familiar to me as a CBAP and CBAP Preparation instructor. There were a handful of tools and techniques that were new to me, and I took some time to study up on these. In hindsight, this review provided some help, but not a significant amount. Those without significant exposure and experience with the tools and techniques will find this a critical step in studying for the exam. The PMI-PBA exam was a typical certification exam requiring me to slow down, review the question, analyze the answer, and then select what the best of the available answers were. In a few instances, there was a single clear-cut answer (YAY!). Many more questions, however, required me to eliminate answers to get to one or two choices for the best answer. Questions were designed to ensure that the test taker understands how to apply knowledge and best practices in business analysis. This means a lot of situational questions. Themes included traceability, impact analysis, stakeholder management, and change control. Bottom line! If the tasks and tools and techniques listed in the exam content have not been your focus in work or education, additional preparation time and effort will be necessary. Project managers who have done business analysis will need to spend some time to ensure they understand the practice of business analysis separate from the project management role. Watermark Learning has launched a project to develop a certification preparation course and online study exam. The process for studying and sitting for the PMI-PBA exam gives us great ideas on how to best build our preparation course curriculum to meet the needs of future PMI-PBAs. Our online study exam is targeted to be online in August 2014. Our pilot preparation course is also targeted to be open for registration in August and the course held in September 2014. The following graphic provides information on additional Watermark courses that you can take now to begin to prepare. Please keep in mind the professional development requirement for the certification is 35 hours. You will likely need to supplement the preparation course (typically 21 hours) with additional professional development to meet the requirement. PMI has provided a reference list on the PMI-PBA page. A Guide to the Business Analysis Body of Knowledge® (BABOK® Guide) and Practitioner’s Guide to Requirements Management, 2nd Edition are two additional resources that I recommend. Also see our PMI-PBA resources page for a more exhaustive list of available resources. Awesome illustration of your experience Vicky! I did try to take the CBAP twice but was not successful both the times. I have now decided to say good-bye to CBAP as it requires 90% + to pass and I shall concentrate on PMI-PBA. Thank you Sudhindra. I am sorry to hear you have had trouble with the CBAP. I really don’t know that the PMI-PBA is any easier or harder than the CBAP. I wish you the best of luck and hope you will come back to share your success with us. “Chapeau” as we say in Europe to give someone credits! Your article is perfect especially for me as I have scheduled my PMI-PBA exam by Aug 1st in Brussels. I like the table you have created very much! Naturally I am now seeking for resources which could help me preparing for the exam. As the leading German Watermark Learning Partner our company masVenta will offer the PBA course once it is available for Partners, and in order to be perfectly prepared I will hopefully be one of the first PMI-PBA’s in Germany at that time as well. So, I am crossing my fingers that you have successfully passed the exam and I am keen to do the same soon. Greetings to all at Watermark, you are great! Thank you Rainer. I look forward to helping more of our German peers as the couses and materials get finalized. Good luck on August 1st! Rainer Wendt, CBAP, PMP, PMI-PBA ? I know, getting crazy, huh? congratulations for passing the certificate 🙂 , i am still have some troubles in how i can prepare for the certificate and the exam. so please try to illustrate more how i can prepare and study , should it be through a course or it can be my self study and what are the materials required. Hello Emad! Just one point of clarification. I won’t get confirmation of a passing score until after the pilot phase. We at Watermark Learning are in the process of developing more specific curriculum and materials for study for the PMI-PBA certification. The pilot phase is first opportunity to get a preview into what to expect in order to do this. We will have course information published and an online study exam simulation in mid-August. You may consider waiting until this time to begin your preparation if you are still hesitate after reading this article. I am a PMP and CBAP instructor and now working on doing the PBA test this July. I guess you article goes in line with what I had in mind. Yet I was wondering if there are some key processes (or Tasks as per IIBA) from the BABOK that you felt are useful for the PBA exam. Thank you Afif! In general you will need to have a good comprehension of the BABOK. But I really can’t point to any specific KAs or processes to hone in on. Good luck to you next month! Successfully Cleared PMI PBA certification!!! Vijay, did PMI inform you that you passed the exam? My understanding is they won’t notify candidates until October. Wondering if you have an updated status on this? Is there any way to find out how many PBA’s have been granted? I’m just curious to know how this is ‘taking off’ and being received. Thank you for stopping by and reading about my test experience. PMI will not begin awarding credentials until October (I suspect late October). I think we will hear a lot more on around around the time of the PMI North American Congress (10/26/2014). I think this will be a commodity in the short term, but I am also curious. Hi , I will be thankful if someone let me know the total # of Question in the PMI-PBA certification exam, and passing marks? Syed, the exam has 200 questions, 175 of which are scored and 25 are experimental. We estimate it takes a 70% passing score, but PMI has not published the exact passing score. Good luck on your exam! Guys, I have my exam on 28th this month. Any question paper dumps for me to practice. Good to hear that you are prepping for your PBA exam! I believe you are asking for ideas about what to include in your “brain dump” or notes that many test takers write on scratch paper at the beginning of the test. It really depends on what would be helpful for you. Two things to consider: 1) What question might you find easier to answer if you had a written reference to trigger your memory, and 2) How might a brain dump exercise help you calm down at the beginning of the exam to collect your thoughts and get you in the right frame of mind. Some high level things around the types of models to use such as what they’re used for and when could be helpful. 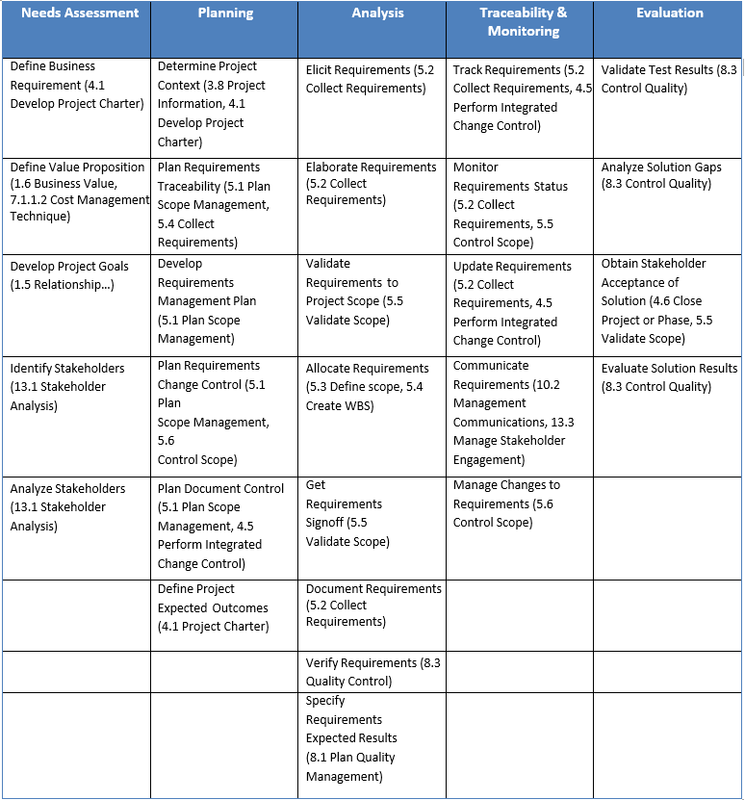 Or it might be helpful to create a short description of the tasks within each domain to get you to think about what you’re doing as part of Needs Assessment or Planning, etc. It really depends on the test taker. Remember that you can’t start your brain dump until the exam starts, so whatever you choose to include, make sure it doesn’t take you too much time as that will take away from your exam time. I hope this helps. If you have further questions or I misunderstood your question, please feel free to contact us at info@watermarklearning.com and we can connect to discuss more.